Even more importantly, is that your guests will enjoy lots of Inter-Action and Audience Participation, Tons of Costume Changes and lots of fun! Our (optional) Dance Team raises the bar even further, making your event more than just fun - It trully becomes a Unique Entertainment Experience that you and your guests will NEVER...EVER forget!!! 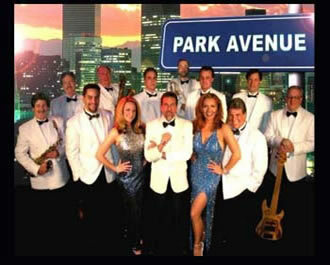 PARK AVENUE's repertoire covers the Hottest of Today's Hits, and takes you all the way back to the Great Big Band Era, through Oldies & Motown favorites from the 1950's and 60's, Classic Rock, Disco, Funk and Dance Hits from the 1960's and 70's, Retro Pop and Rock Hits from the 1980's & 90's, and right back to today! So Remember: When you need only the best entertainment available for your most important events, you only need one address - And that address is PARK AVENUE!!! This client's entertainment broker experienced Park Avenue's inter-active, high-energy show at this year's "Special Event 2002" in Phoenix! "Park Avenue" created quite a stir at this year's "Special Event 2002" held in Phoenix this past January 10 - 12. Entertaining 1,300 lucky ticket holders at the sold-out "Opening Night Party", the packed tent of party-goers danced and partied 'til well past the published ending time of the event, and "Park Avenue" left them screaming for more! "We were blamed for alot of hangovers! ", said Emerine, Park Avenue's leader following the party. For the 2nd year in a row, "Park Avenue" entertained the sold-out crowd of guests. "Park Avenue" entertained 1,000 attendees at this year's annual convention at Denver's Adams Mark hotel. Following Lee Greenwood's performance of "God Bless the USA", "Park Avenue" launched into their own Patriotic tribute featuring leader Patrick Emerine in his rousing rendition of Neil Diamond's "America", which got the entire crowd to their feet, and to the dance floor. Park Avenue performed for the 3rd year in a row for the "HealthOne Gala" at Denver's Performing Arts Complex. For the 2nd year in a row, Park Avenue entertained the guests at the Denver Botanic Gardens gala, again keeping all of the guests dancing through to the end! July, 2001: Park Avenue Repeats at the Denver Area's "Leukemia Cup Regatta"
Park Avenue rocked this party for the 2nd year in a row, leaving the tent full of party-goers screaming for more!